My first step was reviewing her current website to get a feel for the flavor (no pun intended!) of Patty's existing content. This information, along with her answers from our brand questionnaire, helped us determine the vision and mood of Patty's brand. For her logo, I played off five keywords that were identified by Patty: energy, balance, cheerful, organic, and growth. 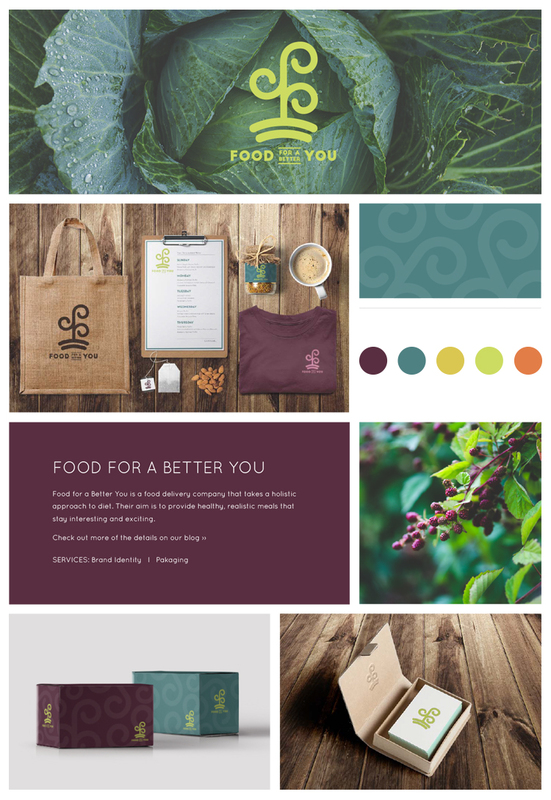 I used this insight to create a range of logo options that I felt embodied the spirit of Food for a Better You. Patty was drawn to the second option, which was my favorite as well. It truly felt like the logo that best fit Patty's vision for the company. The design of the logo is based on a Celtic symbol for peace and hope. I adapted the basic shape into a leafy sprout shooting up out of the ground. The shape resembles an "F" for the first word in Food for a Better You. Once we had the logo finalized, I selected colors that matched her organic, peaceful mentality. The final brand package included mockups of how Patty could apply her brand to packaging, print materials, and promotional products. Food for a Better You was an exciting opportunity to help Patty reinvent her brand. If you're looking for something similar or even if you're starting from scratch, I'd love to help you. Use our Contact page to tell us a little bit about your company and branding needs. We'll be in touch!